NS Artist-in-Residence Julia Holter premieres Tragedy Opera, an audacious staging of her debut 2011 album, Tragedy, partnered with artists Yelena Zhelezov and Zoe Aja Moore. Providing the musical backdrop will be newly arranged music performed live by NS Group-in-Residence wildUp alongside Holter, Zhelezov, and Moore. 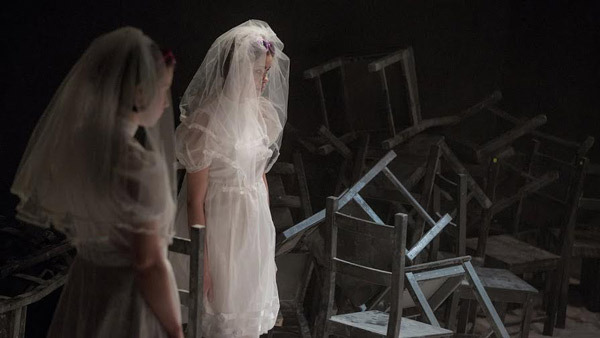 In his play Hippolytus, written over two thousand years ago, Euripides explored the tragic depths of human shame and self-destruction under oppressive powers, themes which remain relevant today. It was this play that serves as the basis, inspiration, and even some of the text for Julia Holter’s 2011 album, Tragedy. The original recording of Tragedy consists of layers of melodic songs, found sound, and atmospheric instrumental music—an emotional collaged response to the classic work in Holter’s signature contemporary female voice. The opera will bring the sounds from the record (recorded all and mostly performed by Holter in relatively low-fidelity) into a live setting of new arrangements. Tragedy will encounter and play with themes that resonate with both the classic text and our contemporary moment: the complexities of shame, loss of empathy, and our inability to see ourselves and one another clearly. The mise-en-scene of the opera will draw upon the visual elements that originally inspired the music—shadows, reflections, echoes, fragments, statues—and will layer vocal performers, multiple channels of video (both live and sourced content), and performing objects to create a haunting emotional landscape. Julia Holter is a composer, performer, and recording artist based in Los Angeles. Her most recent recording was the studio album Have You In My Wilderness (2015), which followed her previous albums, including Loud City Song (2013), Ekstasis (2012), and Tragedy (2011). She has performed at venues and festivals throughout Europe, North America, Asia, and Australia, and has had piece commissioned by and/or has performed with ensembles such as the Los Angeles Philharmonic and Stargaze Orchestra. Zoe Aja Moore is an LA-based artist who works primarily with live performance. Recent works includes: A Streetcar Named Desire, presented at the 2015 Live Arts Exchange (LAX) Festival, Bootleg Theater; Dedicated to a True Lover (and therefore probably nobody) presented by Los Angeles Performance Practice; an ongoing site-specific episodic performance of Lulu in homes across Los Angeles; Looking for Lovborg an experiment with Hedda Gabler at RedCat; The Series at the Standard Downtown and the Ace Hotel, LA; an electronic opera adaptation of Story of the Eye (with Kristin Erickson); and Desire Under the Elms at the Walt Disney Modular Theater. Zoe is currently developing Sad Girl through a residency with CAP/UCLA and LAPP. Zoe received her MFA in Directing from CalArts in 2011, and is currently on faculty at CalArts in the School of Theater. Yelena Zhelezov is a visual artist based in Los Angeles. Her practice is concerned with the way that social and personal history is archived and interpreted — and the implications and reconsiderations of the methods used to do so. Zhelezov has shown work at the Hammer Museum, Velaslavasay Panorama, Actual Size Los Angeles, LACA, Baryshnikov Art Center, and Museum of Jurassic Technology. She hosts a monthly KCHUNG Radio show and is a founder of LAMPS (Los Angeles Memorizing Poems Society). The group began in 2010 as a self-funded, completely bootstrapped project of wild Up’s Artistic Director and Conductor Christopher Rountree: after graduate school, Rountree returned to Los Angeles wanting to create an ensemble made up of young musicians, a group that would reject classical music’s most outdated traditions and embrace unusual venues and programs that throw the classical repertoire into the context of pop culture, new music and performance art. The group’s first few concerts at art studios and rock clubs around L.A. created a fervent fanbase of true believers. Then UCLA’s Hammer Museum tapped wild Up as the museum’s first ever Orchestra in Residence, and after dozens of concerts in the Hammer’s halls, courtyards and galleries, the L.A. Times proclaimed the group “Best Classical Music of 2012.” It was off to the races, as wild Up began working with musical and cultural institutions around the world. The group has been Ensemble in Residence with the Los Angeles Chamber Orchestra, and played numerous programs with the Los Angeles Philharmonic including the Phil’s Brooklyn Festival, Minimalist Jukebox Festival, and Next on Grand Festival. They started an ongoing education partnership with the Colburn School, taught Creativity and Consciousness at Bard’s Longy School, led composition classes with the American Composers Forum and American Composers Orchestra, and founded and an intensive educational program with the LA Philharmonic in which ten young composers and a faculty of eight legendary composers meet to collaborate on new work. While the group is part of the fabric of classical music in L.A., wild Up also embraces indie music collaborations. The group has an album on Bedroom Community Records with Bjork’s choir Graduale Nobili, vocalist Jodie Landau, and producer Valgeir Sigurðsson recorded in Reykjavik, Iceland; they played with composer Ellis Ludwig-Leone and rock band San Fermin under a tyrannosaurus rex at the Natural History Museum of Los Angeles; they premiered and recorded an opera by Lewis Pesacov of afrobeat band Fool’s Gold about the end of the Mayan Calendar; they performed Mica Levi of Micachu and the Shapes’ score of the Scarlett Johansson film “Under the Skin” at the Regent Theater, Jon Brion’s score to “Punch Drunk Love” with Joanna Newsom, and will perform the score to “Evil Dead” this halloween at the ACE hotel in downtown L.A.
wild Up has been featured at numerous West Coast cultural spaces including the Music Academy of the West, Santa Barbara Arts and Lectures, the Broad Stage, Zipper Hall at the Colburn School, REDCAT, Walt Disney Concert Hall, Beyond Baroque, the Armory Center for the Arts, Santa Ana Sites and Echo Park’s Jensen Rec Center. Their recordings of Shostakovich, Rzewski, Messiaen and Los Angeles composers have been featured on KUSC, WNYC, Q2, KPFK, Alex Ross’s blog The Rest Is Noise and American Public Media’s Performance Today, among many others. Oct 31, 2017 - 7:30pm Don thy bejewelled codpieces, thy neck ruffs and farthingales: Shakespeare cometh! Heartbeat Opera proudly presents its fourth annual Drag Extravaganza for two nights of divalicious coloraturas, eye-popping fashion, and Halloween revelries. April 22nd - 4pm OperaComp is proud and excited to be returning for its second season in New York City, with performances of six brand new scenes for the stage at the Juilliard School and National Sawdust in Spring 2018. October 16, 2016 - 7:00pm National Sawdust and VIA Records are proud to celebrate the release of the original cast recording of David T. Little and Royce Vavrek’s critically acclaimed opera Dog Days. Closed rehearsal of the upcoming Opera residency. This Rehearsal is closed to the public.